I've maintained for years that this event is in many ways the quintessential WBC event - a multiple entry, single-elimination affair which never fails to draw a good-spirited, yet very competitive crowd. Some 42 coaches showed up this year in an attempt to usher in their own hoops dynasty. This year, we moved away from pre-generated brackets for each of the four heats. However, teams such as UCLA were still placed in the West regional, Kentucky in the Southeast, and so forth. Also, players who pulled an upset were still rewarded by their section of the draw opening up. With these changes, I thought we could maintain the flavor of the event, while allowing the rounds to move more briskly than in previous years. As we entered Heat 1, I was curious how the modified format would play out. A major concern I've had after playing this event for the past decade is that some of the top teams had grown so powerful that they would almost never lose in the first round. As such, the teams I selected for WBC 2005 were rated no higher than 94, and even the lower-seeded teams were in the mid-eighties. I needn't have worried: In the Tuesday night regional, three of the top six seeds lost in the first round - including Chris Bauch's dismantling of your friendly GM. So, with any concerns about play balance quickly dashed, the games were off and running with 18 participants for the West regional. Appropriately, it was a traveler all the way from California who had the most success. Mark Yoshikowa didn't waste his trip, steering the Arizona '97 squad to four wins, including a 118-113 barnburner over former champ Dennis Nicholson and the Runnin' Rebels of UNLV '77. Mark then took out Devin Flawd's top-seeded SF '56 team, which lost 96-85, despite 22 points from Bill Russell. Of course, Devin's guys may have been tired after winning an epic 105-100 overtime contest against Sean McCulloch's UCLA '95 in the semis. For Mark, this was a breakthrough - his first time in the Final Four. No less of a thrill - at least for me - was that the heat finished almost an hour ahead of schedule. 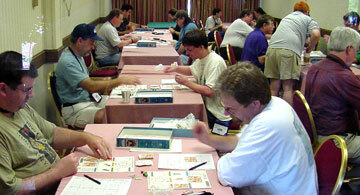 The Mideast regional also had 18 players. The field was strong, with no less than five former champs from the past decade in attendance, but none of them made it past the regional. In the end, none of Jim Bell's opponents could find an answer to Oscar Robertson's scoring for Cincinnati '59, which included 37 points in winning the regional final versus 2002 champion Debbie Gutermuth and top-ranked '63 Loyola of Chicago. This heat proved to be the only one to feature a final between # 1 and # 2 teams. Heat 3 was affectionately known as the 'Duke regional' because of that school's surprising success in each half of the bracket. Bud Sauer, who by his own admission hadn't played MMS in years, managed to shake off enough rust to win three games with Duke '78. But he lost to Bruno Passacatando, who played tough defense and made it to the regional final withDuke '88. Bruno faced former champ Terry Coleman in the regional final, who had led his Memphis St. '73 team to three victories by an average 14-point margin. In a rapid-fire game which was tied at halftime, and featured scoring resolutions on the first four rolls of the second half, Bruno prevailed 64-59. The fourth heat featured the most players with 26 vying for the last ticket to the big dance. Among the strong performances in the heat was Harry Flawd, who garnered multiple double-digit victories with Rutgers '76 in reaching the regional semis. And after a 2-point squeaker in round 1, Roger Taylor made the final of this heat with Georgetown '84. But neither of these seasoned coaches could stop St. John's '85, as John Coussis played tough defense and scored more points with each passing game - including an 89-72 win in the regional final. So, John joined Mark, Jim and Bruno in the Final Four. While all are known as strong players, none had ever won - which meant that MMS would crown only its 8th different champion in the 13 years of the event. One of the things that made this year's tournament enjoyable was the number of teams with 'B' defenses, which resulted in more scoring than usual. The top bracket of the Final Four was no exception, as the two teams combined for more than 100 points in the first half, and 130 in the second half! After the smoke cleared from the singed hoops, Jim Bell and Cincy '59 had a hard-earned 123-115 victory over Mark Yoshikowa and Arizona '97. Meanwhile, in the other semi, Bruno was trying to play his customary tough defense. However, John was having none of it, as his team outscored its opponent on nearly every resolution, building a 12-point halftime lead. Even a technical on the St. John's coach was not enough to stem the tide, as John won going away over Bruno's Duke '88 squad, 85-59. Congratulations to John Coussis for his first March Madness title, and 8th wood overall. Thanks to all the participants, who made this a fun event to run. See you next year. Congratulations to Peter Staab for winning the first BPA MMS PBeM championship. Peter coached his 1977 Marquette squad via the ACTS website through six victories to win the title, defeating Ken Gutermuth's 1996 Massachusetts squad 78-60 in the final. Dennis Nicholson, Chris Palermo, Bruce Reiff, Derek Landel and Steve Caler also suffered defeat at Peter's hand. The latter's Kansas '74 team fell in the Final Four by 21 points. Tentative plans are to do it all over again next October. Staab improved from 21st to 4th in the 2004 Caesar race while Gutermuth moved up from 15th to 7th. In all, 30 players constituted the initial field with 59 games played in the event. Also scoring laurels were John Coussis 4th (Virginia '81), Carrie Lewis 5th (Cincinnati '63), and Derek landel 6th (Kentucky '78). Marquette's Butch Lee was named the tournament MVP with a 25.5 scoring average for the champion Warriors. Also named to the all-tournament team were Bo Ellis of Marquette, Ralph Sampson and Jeff Lamp of Virginia, and Marcus Camby and Dante Bright of '96 Massachusetts.